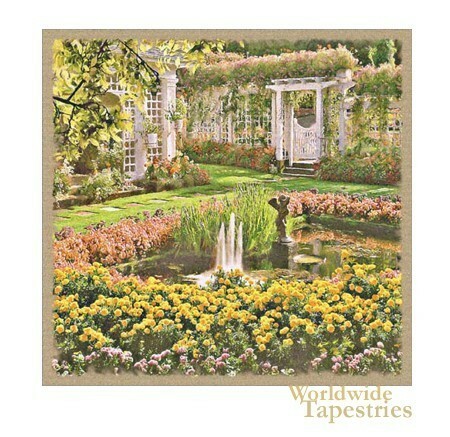 In this tapestry, we see the famous Buchart Gardens in British Columbia, Canada, specifically on Vancouver island. The entire garden features over 22 hectares of a variety of terrains filled with flowers and water features. In this scene we see a part of the gardens with a central water feature and statue surrounded by manicured gardens and an abundance of flowers. This tapestry is backed with a lining and a tunnel for easy hanging. Dimensions: W 37" x H 36"
Dimensions: W 56" x H 54"